Well, what a lot of hassle that was! I reckoned if I googled ‘Bara brith’ it would probably turn out to be Welsh for ‘don’t try and make this in a bread machine’. 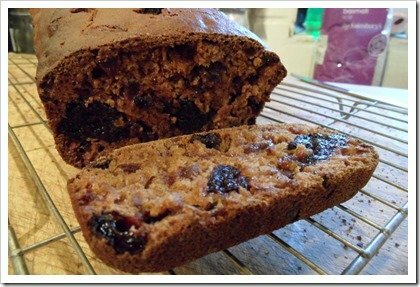 I have no idea why, but it came into my head I fancied some teacake/fruit loaf type bread, so I had a look in my bread machine books and Bara brith was the closest I could find. It looked simple enough; soak some fruit and sugar in tea, then add to the machine with flour, egg, bicarbonate of soda and cinnamon, then press start. The problem was, I think (I’m not an expert on bread machines), the instructions to use the ‘cake’ setting. It just wasn’t long enough. It did its mixing thing nicely, but only had about an hour for the whole program and although the book said if it’s not cooked properly, set the machine to extra bake and cook for 10 more minutes, mine doesn’t have an extra bake setting and it was nowhere near cooked – it was a gungy mess. I emptied the gungy mess into a loaf tin and baked it in the oven for a while but it was still a disaster and ended up in the bin. I thought I’d try again today and asked Facebook if it thought if I used a bread setting instead of a cake setting, would that work? The general consensus was ‘don’t know’ although Adele (being Welsh and therefore knowing about Welsh things) said there was no need to use a machine as it’s not bread and there would therefore be none of that mucky getting your hands dirty thing I hate. All it needed was to mix the ingredients and put it in the oven for about 90 minutes but to check it after an hour. I didn’t fancy my chances of mixing the ingredients thoroughly, so I let the bread machine do that (I put it on the fastbake setting until it looked thoroughly mixed, then turned the machine off – would probably have been easier to use a food processor), then poured the mixture into a loaf tin and baked it in the oven for about 90 minutes. After a bit of a struggle, I eventually got it out of the tin in one piece (should have used lining, duh) and I’d love to say it was worth the hassle but, although the inside is delicious and moist, the crust is a bit too hard and chewy. That didn’t stop me having two slices though and I can’t see the rest of it lasting much longer. Put the dried fruit and sugar into a bowl and cover with the tea. Leave to soak for 4 hours or overnight. Pour the mixture into a greased and lined loaf tin and cook at 150C for about 90 minutes (check on it after an hour). Da iawn! I hope you had it with butter, that’s how we do it in Wales (and south east London…). 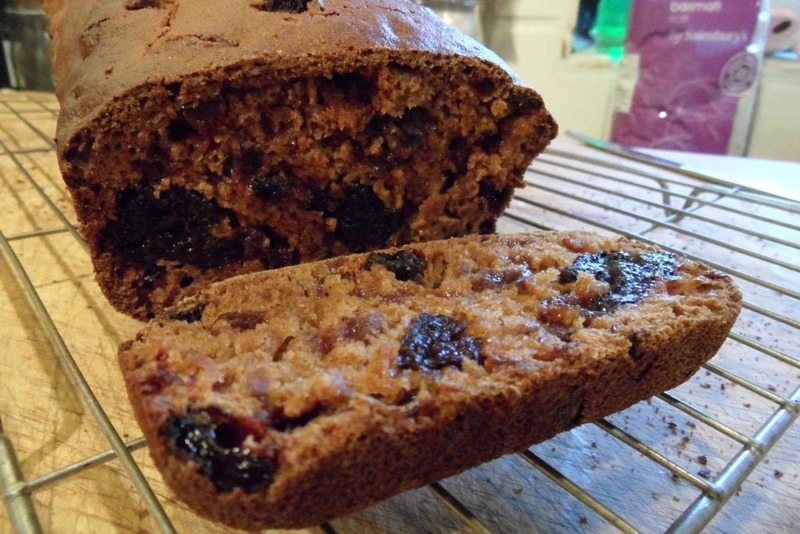 Bara Brith is a lovely bake, so fruity and delicious.